“Damn, this is nice for a Kia.” I heard that a lot during my week with the Optima SX Limited (SXL). The SXL is the biggest and baddest Optima trim. It's fully loaded and is pricey for a Kia at $36,000 (my tester had an MSRP of $36,615). I’ll admit that I was skeptical of a Kia priced at $36k. The automaker built its reputation on cheap cars with bulletproof warranties after all. 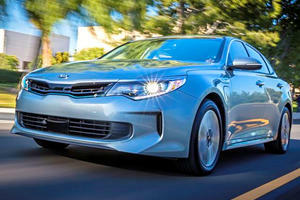 But after a week with the Optima SXL (provided by the automaker) I’m convinced that spending $36,000 on a Kia isn’t crazy. 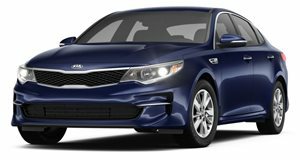 Under the hood of the front-wheel-drive Optima SXL is a turbocharged 2.0-liter four-cylinder engine making 245 horsepower and 260 lb-ft of torque. In power the engine plays second fiddle only to cars in its class with a V6. The V6 Accord puts out 278 hp and 258 lb-ft of torque and the Camry is rated at 268 hp and 248 lb-ft of torque. 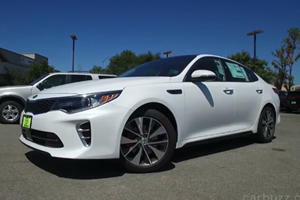 The transmission is a six-speed automatic with paddle shifters and two driving modes, “Eco” and “Sport.” There’s a bit of turbo lag but I found the Optima SXL to be pretty damn zippy once off the line which makes sense as its 0-60 mph time is 6.6 seconds. But I never really found myself wanting to test the Optima through corners and rarely touched the paddle shifters. I drove mostly in Sport mode which is probably why the car was so thirsty. Its official mpg split is 22/32/25 but my highway mileage was usually in the low-20s and sometimes as bad as the high-teens. The Optima SXL looks pretty damn good, and that’s thanks to Peter Schreyer. The German is Kia’s design chief and one of its presidents (there are three). He had a big hand in the design of the first Audi TT and the New Beetle and is responsible for making Kias not look like crap. He joined the company in 2006 and created the “tiger-nose” grille found across the lineup. Now the Optima SXL isn’t as emotional a design as, say, the Mazda6, but it does stand out among its peers. The front end is trim and powerful thanks to the combination of its slim grille and massive hood. The roofline—that full panoramic sunroof is gorgeous—tapers off towards the rear, giving the Kia a semi-sporty look at the cost of rear headroom. The sporty theme continues in the back with a dual exhaust, decklid spoiler and pseudo-diffuser. The only major miss for me were the tacky “Turbo” badges on the front fenders. The Optima SXL’s engine and looks are better than average, but that’s not what convinced me that spending $36,000 on a Kia isn’t crazy. It was the wealth of standard luxury and tech toys. The quilted Nappa leather seats are heated (front and rear) and ventilated (front only). The cabin is plenty roomy and comfortable, save for the rear headroom complaints (I'm 6'1"). There’s 15.9 cubic feet of space in trunk which would easily fit a family of four’s luggage or a crap ton of golf clubs. For infotainment and navigation there’s an 8-inch touchscreen controlling all the action. Sound is piped into the cabin via a 10-speaker Harman/Kardon QuantumLogic sound system. Kia’s UVO eServices suite of apps comes standard but I didn’t get to try it out. Using your phone you can get everything from a vehicle diagnostic report to a car curfew alert (useful for parents) sent straight to your phone. 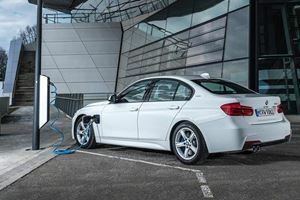 There’s also a full set of safety tech, including: rear cross-traffic alert, blind spot detection, lane departure warning system, radar cruise control and front collision warning. Parking is made infinitely easier with backup assist and a full 360-degree camera view. Anything I missed? Hmm...keyless access and rear window shades are also standard. Now despite packing all these goodies the Optima SXL isn't much more expensive than its competitors. The top-tier Accord Touring is $35,515. But a wireless charging pad (standard on the Kia but Android-only) is $290 extra. The Camry XLE Hybrid crushes the Kia’s gas mileage and is cheaper at $30,975 but a full tech package with navigation, premium sound and apps is an extra $3k. Shockingly no Teslas are found in this group. Is The 2017 Kia Optima SX Turbo A German Luxury Sedan In Disguise? We find out in our latest unboxing review.